On the 9th Day. Here are the nine ball flights that you should be aware of so you can begin to understand how to make adjustments when they create problems in your game. On the 10th Day: 10 Things Obama Might Learn From Tiger Courtesy of Golf Digest: 1. The Quick Recovery. 2. The Cold Ferocity. 3. How To Step On Their Necks. 4. The Trouble With Compromise. 5. The Value Of A Few ‘Majors’. 6. Controlling The Message — And Spending. 7. The Swing Change. 8. Close The Deal. 9. You’ve Got To Deliver. 10. The Danger Of Looking Ridiculous. To learn more about these 10 ‘Golf Related’ Tips check out the January 2010 Issue of Golf Digest. On the 12th Day. Twelve degrees forward applies to the amount of forward hip bend you create at set-up. This is by no means an absolute. There are all sorts of different postures among PGA Tour Players. 12 to 18 degrees is the average forward bend range among tour professionals tested at the Titleist Performance Institute. As a generalization, forward hip bend helps provide balance and stability in your golf swing. It is an athletic position that is similar to the positions other great athletes utilize. Baseball players, boxers, basketball players, football players and most any athlete has more success when bending at the hips rather than slouching at the waist. On the 2nd Day. Connected arms actually means that the distance between your forearms and elbows is not excessive due to bending of the elbows. The connection is most important through the impact zone. There have been good players who have lost connection at certain points in their swing but recover in time for the impact zone. On the 3rd Day. There are three checkpoints for a flat wrist position that increase your odds of good impact and straight ball flight. The lead wrist (wrist closest to the target) should be flat or slightly bowed to the top side of the lead forearm and facing the target at impact. This is an absolute and checkpoint #3. The first two checkpoints for a flat lead wrist are not absolutes. There are good players who do not achieve these checkpoints and still achieve checkpoint #3. 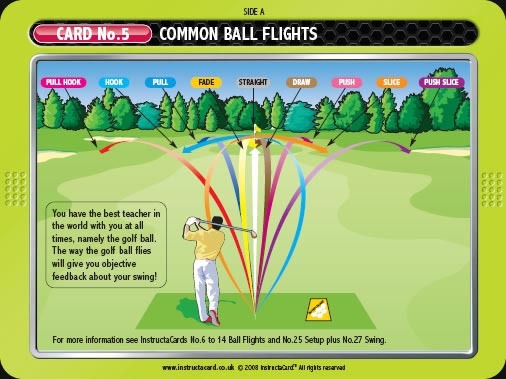 However, if you are looking to achieve a simpler swing, checkpoint #1 and #2 are helpful. As you can see in photo #1 and #2 the lead wrist is flat to the lead forearm. On the 4th Day. Four Finger Grip encourages more swing speed and a better release. The four finger grip applies to your lead hand. I define it as the position in which you place the grip on a diagonal line from the crease on the middle knuckle of your index finger to the crease on your pinky finger that connects it to your palm. A majority of the golfers that struggle with a slice consistency place the grip on their palm instead of the diagonal line across the four fingers as I have described here. On the 5th Day. Five degrees of tilt represents a spine (or sternum depending on how you look at it) position at setup where the spine is tilted five degrees away from the target. This is by no means an absolute. There are good players that set up with spine directions as much as a few degrees towards the target to as much as 15 degrees away from the target. However the average tour player is close to 5 degrees of tilt away from the target. Use the K-VEST 3D wireless technology to discover your exact degree of spine tilt. 1. Use the right side of the tee box on a dog leg right. 2. Use the left side of the tee box on a dog leg left. 3. When reading the break on your putt take a look at the entire expanse of land around the green to determine dominant slopes. 5. Get a cup shrinker and practice your 3 footers until the real hole looks like a bushel basket. You can find a cup shrinker at http://www.practicerange.com/No-3-Putt-Cup-Reducer-P345.aspx Free shipping if I order it for you! 6. Find a golf coach that helps you understand and achieve better impact, eliminates unnecessary thoughts, motivates you, listens to you, commiserates with you and celebrates with you. 2. You need to keep your eye on the ball. 3. You need to slow down. 4. You need to transfer your weight. 5. You need to swing out to in when hitting out of the bunkers. 6. You need to get under the ball. 7. You need to play the ball off your lead foot for tee shots.